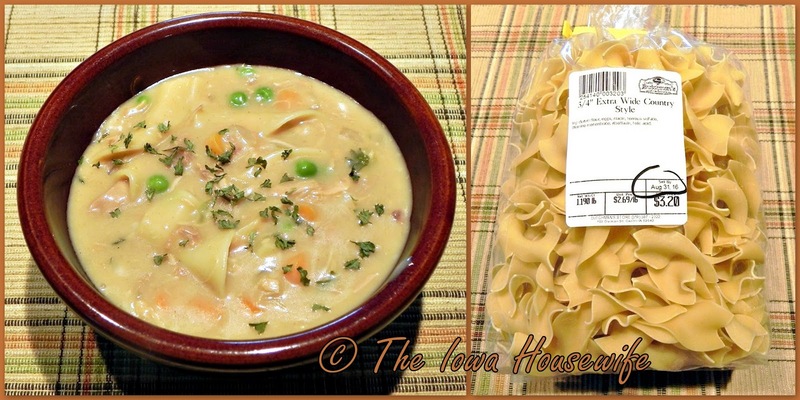 My husband likes thick soups and wide noodles…here’s a recipe that combines both! This is a simplified version of the Pennsylvania Dutch dish. I use either poached chicken from my freezer, or home canned chicken and broth to make this faster. I purchased ¾” noodles from The Dutchman’s Store in Cantril, Iowa. The Dutchman’s also had pot pie squares, which are simply the same noodles cut in 1” squares – more authentic, but not as versatile as the ¾” noodles I use. You can also make your own egg noodles or squares…they will take longer to cook. You can add diced potato; some cooks use it and some don’t in this type of soup. Use a little sage and nutmeg instead of the poultry seasoning for a different but delicious taste. The better your broth, the better this soup is. Bring the chicken stock to a simmer in a large pot and add the celery, carrots, onion and noodles. Simmer uncovered for about 10 minutes, until the noodles are cooked. Make a slurry of the milk and flour, stir into the broth. Add the cooked chicken meat and peas and heat through until thickened and hot, about 4-5 minutes. Season to taste and serve. Per Serving: 217 Calories; 5g Fat (20.6% calories from fat); 25g Protein; 16g Carbohydrate; 2g Dietary Fiber; 65mg Cholesterol; 93mg Sodium. Exchanges: 1/2 Grain(Starch); 3 Lean Meat; 1/2 Vegetable; 0 Non-Fat Milk; 1/2 Fat.